American footballer, who has played Quarterback for the San Diego Chargers and New Orlean Saints. At the NFL combine he measured a little over the 6ft mark and has claimed "I'm 6 feet" and "I am six-feet, 1/4 inch.". I admire how honest he is! 🏆! 🐝r🐝! He's easily six feet tall. He was significantly taller than Matthew McConaughey and Luke Bracey. So yeah. I've always assumed this height was correct. However multiple people are now saying he's not an inch above 5'10". If this is true I wonder how he fooled us all. No way an athlete in his 30's has lost height right? He measured 6'0¼ at the NFL Combine, which likely means he is 6'0 flat in the afternoon. He bust a gut for an extra few mm's to get that six foot mark. The 6'0.25" is a morning measurement. I've never met Brees but I've been in the same room with him (if you count the Superdome as one room), and from the front row where I sat during the 2012 NFC Divisional game he looked right at 6'. For what it's worth, Rob, calling him or any American football player exactly that (an American football player), or an NFL quarterback (or wide receiver, running back, etc. ), would be perfectly fine and eliminate confusion, as players are routinely referred to by their position. I read something from Brees before the draft and I'm sure he said he hoped to measure 6ft 1, but we'll see about it. 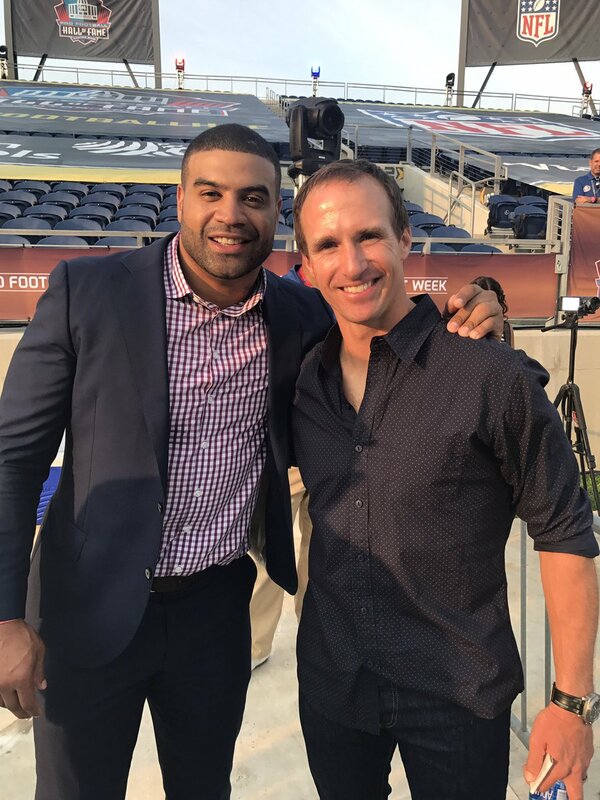 Drew and Shawne Merriman who nobody can agree on. Rob, when you say "American footballer", you refer to soccer (football) players. I think it should be "American football player" instead. Since the tag only appears on players who are in the NFL, I thought it was a shorter version. It's unfortunate Americans also use football to describe the sport. It has been a long-term point of confusion. He can look 1½-2 inches taller than Matthew McConaughey. Brees strikes me as a solid 6'0, he could be anywhere in the 183-183.5cm range. The poor bloke is gonna have a heart attack when I list him just under 6ft 2 then! I would class him just under 6ft 2. Rob, how likely is a little over 6ft? Editor Rob: considering measurement times, I think most nfl players would shrink another 1/4 at least, so he may well hold onto near 6ft flat or at worst just under it...bursting a gut I'm sure he's a little over 6ft in the afternoon though. @NFL nerd, I remember the Chase Daniel thing, it was evident though right off the bat that Brees was noticeably taller. And I know the combine has gotten much better over the years as a result of the NCAA outright lying about player listings and coaching staff becoming increasingly irate to find their prospects were much shorter (and at times even taller) than their listed heights. That's when draft combine listings became almost completely accurate. Brees entered the league in the early 2000s so I assumed he would suffer the same fate as others, but he does appear at least 6'0. It's only in certain instances where he seems shorter than his listing. here he is with Jimmy Fallon and easily an inch taller. and here he is with Tim Tebow and Dan Marino. With Odell and Russell Wilson he absolutely doesn't look more than 5'11, but they are honestly the only places I've seen him look sub 6'0. Rob's listing works best in all honesty. Rob, could his lowest be 5'11.75? Editor Rob: he might at worst go slightly under 6ft, later in the day, for the most part I'd call him a decent enough six foot. Unfortunately our precious combine is not 100% accurate. A relevant example, Chase Daniel, Brees former backup, was measured 6 feet on the dot at the combine. Chase has been referred to as a midget and is substantially shorter than Drew Brees in pictures. Its clear fudging is allowed for certain players. The combine is a morning measurement and pro days, senior bowls, etc are typically afternoon measurements. So it's possible for drew to drop from his combine 6'0 1/4 to the 5'11 7/8 measurement. Kirk Cousins for example, measured 6'2 5/8 at the combine, but 6'2 1/4 at his pro day. Ultimately, I think he's a 5'11 guy. KH, The NFL absolutely does do barefoot measurements! And mostly always list their players barefoot height measurements (rounded up or down to the nearest inch) on the rosters. Unlike the NBA...who take both barefoot & shoe measurements. And 99% of the team list their height in shoes on the roster. Vince Vaughn is looking pretty short in that photo next to Brees. Not sure if he is the full six foot. Also, you have to be careful about combine measurements when it comes to the NFL I am not sure they do barefoot measurements like the NBA does. It's quite surprising to see a 5'11.5" guy get measured at 6'0.25" then. His combine measurement must've been straight out of bed. Either that, or there could be an error, like how a few NBA players have their pre draft height listed inaccurately. Made Vince Vaughn look 6'3"
Wonder which one is accurate. Both, he just stood a little taller. I often measure 5'8 7/8, and can get back on and scrape 5'9. "When Brees is measured, the attendant pauses before barking, 'Five-eleven-seven [5'11 7/8"].' The audience groans. Brees steps back and stares at the scale and its operator. He asks to be measured again. 'Six even!' bellows the attendant. Scouts applaud. 'He's a good kid; we all want him to be a 6-footer,' says Lacewell." Wonder which one was accurate. I thought he was under this mark because of the Russell Wilson and Beckham pics but with Tim Tebow it holds up. I was wrong. Solid measurement, he has easily an inch over 5ft 11 Luke Bracey in this photo. Measured 6'0.25" at the draft Click Here but that was an early measurement so I can see him at 6'0" like he's listed here, or possibly 182.5cm also. No, you don't ever hear about how much shorter he is than 6ft, rather you hear often about how short he is for his position. Wow, really? All you ever hear about this guy heightwise is how he's supposedly so much shorter than 6ft. I can't say I've ever looked into it, but it may just be because he's pretty short for a QB and thus doesn't look tall on the field, so people think he is shorter.